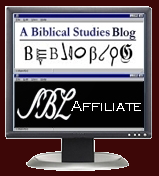 While not specifically concerned with biblical studies, I thought I would mention a few presentation tools that I have found helpful. Whether you are projecting PowerPoint or Bible software or any other program, these are handy tools. ZoomIt, free from Microsoft, is a "screen zoom and annotation tool for technical presentations that include application demonstrations. ZoomIt runs unobtrusively in the tray and activates with customizable hotkeys to zoom in on an area of the screen, move around while zoomed, and draw on the zoomed image... ZoomIt works on all versions of Windows and you can use pen input for ZoomIt drawing on tablet PCs." This works great, and I especially use the zoom and draw features. KeyJnote--a free, open source application--provides an interesting, alternative way to make presentations. It basically requires that what you want to be displayed first be rendered as PDF documents. (This is not hard to do. Logos, for example, has built-in support for PDF creation. Adobe Acrobat is the primary name in PDF creation software, but there are also quite a few free PDF converters available. The one I like best is PDFCreator. If you are using PowerPoint, you simply 'print' your presentation slides using PDFCreator and it renders each slide into a PDF file. Remember too that SnagIt has the native ability to convert screen captures into PDF as well.) Simply drag and drop the PDF file/s onto the KeyJnote icon, and it starts the application. You don't have any PowerPoint animations, but there are nice page transitions. 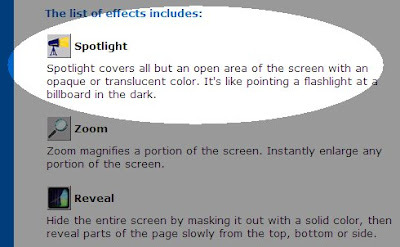 Particularly useful, however, is that the program makes it easy to create a spotlight or highlight box on the page. It also has an 'overview screen' that is really nice for moving around within a presentation. It would be nice if PowerPoint offered such a useful feature. How much Greek do you really have to memorize?